That was strange. If someone knew of his circumstances, why not assist him openly? He went to put the note into his pocket… and found another already there. 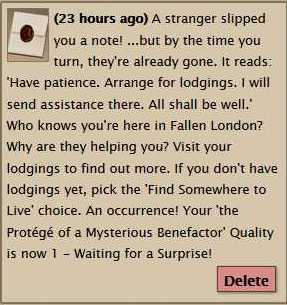 One of the fellows who helped you escape seems to have slipped a note into your pocket. Probably the one who winked and smiled at you while he was removing you from the blimp. Hum. Regardless, it is addressed with a simple “To whom it may concern,” written in beautiful cursive script. This is offset somewhat by the fact that the signature seems to be written in blood. Oh dear. That /has/ to be bad for one’s health. Does he sign all his notes like that, or only those directed at complete strangers? “To Whom it may Concern: We thank you for your aid in allowing my employees to regain their freedom. We assure you that they will make good use of it. We find ourself in your debt, so if you require any services that a normal individual cannot provide we would be more than happy to provide you with them. We may also send you” the letters become more thick and dark at this point, as if the writer had paused for a while, then dipped his pen and started again “gifts from time to time; we assure you these gifts will do no lasting damage. Yrs. Sincerely, Snowskeeper Ferenczy.” Charming. The doctor’s moustache trembled. What had he let himself in for, acquainting himself with such people? Clearly, he needed to get himself off the streets and into some clean collars, before he attracted any more attention. He dared not make inquiries with the police before his credentials were in order, but a helpful tobacconist at the corner of what he was sure was Marylebone Road and Baker Street pointed him toward a local mission for respectable men who had fallen upon hard times… and, even if he had only fallen that very day, surely someone would be able to assist him through his temporary embarrassment. This was the very thing! His hostess – a buxom, lingering woman, who wore a tower of false red hair – had promised earnestly to write to the hospital concerning the redirection of his mail (“It doesn’t always come on time down here – they tell stories of rats getting into the post.”) and to introduce him to the local vicar (“A most devoured – er, devout – and highly intelligent man – I’m sure you will have so much to talk about!”). The bed was a trifle firm for a gentleman of his years, and there was only the one maid to manage the both of them as well as a paying lodger on the top floor, but the house was on a charming street and someone was making a concerted effort at keeping the trees outside alive, despite the want of sun. His next step was to locate some replacement clothes. He had not the time nor the means to have anything made up, of course, but surely he could find something ready-made that would suffice for the moment? A few inquiries led him to a small pawnbroker’s, where an earnest youth with a birthmark over one eye was eager to assist him in locating a second-hand suit, along with a cheap razor, brush, comb, and a pair of handkerchiefs that had belonged to someone’s late uncle. These took up the better part of the money the widow had loaned to him, and he tucked the remainder into his waistcoat pocket and chewed upon his lip. How was he to survive? Upon returning to his new lodgings, he found he had three packages already waiting for him. The first, wrapped in pale tissue-paper, contained a handsome jewellery-box, along with a short letter. Well! That was kind indeed! He remembered Mrs Ledford, and the most amusing anecdotes she told of attending the Governor’s balls. Inside the box were a number of valuable stones – he hated to think of it, but were there any delay in recovering his property, taking these to a jeweller would ensure he didn’t go hungry. For now, he put the lid back on the box and placed it on the tallboy. The next package was rather larger, and contained… a pair of shoes? 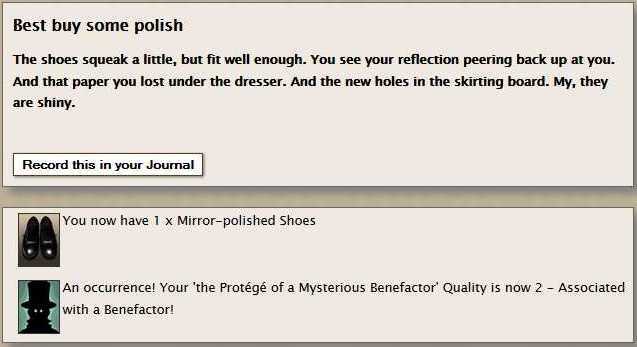 They were unexpected, but their shininess pleased the doctor greatly. These would do very nicely indeed. There was a note along with them, in the same hand as that which had been handed to him in the street. …a furry tangle of death and putrescence. He dropped the box to the floor and staggered to the basin, gasping. Who would send such a thing, and for what reason? A slip of paper had fallen from the mess – a playbill for a theatre on the other side of town, with a message scrawled on the reverse in a substance rather like tar: “local lunatic just passing through”. And now he had a box of rats. How delightful. “Life down here” was overwhelming indeed.